Some months ago I bought some ‘zing string’ — cotton thread with hand-tied beads strung along it. I haven’t had time to use it till now. This is a plain weave scarf, cotton warp, rayon weft, with the zing string adding some bling at random intervals. 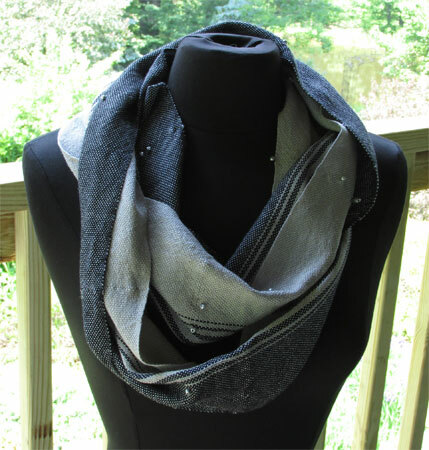 I wove two scarves with the silver rayon weft & plain weave. Actually, the first one on the warp had a black cotton weft and I wove in lace blocks with the bling randomly placed. It was fine, but when I tried the tabby with the silver rayon, I knew I’d do the other 2 scarves in that. Off the loom, I like them both. I like the black better than I thought I would, actually. But I showed you the tabby first because the bling shows up better. I sewed all 3 into infinity scarves. I did a bunch of ‘not-weaving’ today. Although I wasn’t wasting time, I’ll be darned if I can tell you exactly how the day went – beyond seeing a black bear cross the road 63 steps in front of me on my morning walk! I’m calling this weaving draft I came up with for my next warp of 3 scarves corkscrews & waves. I got 262 ends of 20/2 natural silk measured, beamed, and threaded on the Macomber. I have all of about 6″ woven…enough to know I don’t have any threading errors. I hope I can get all 3 scarves woven tomorrow. 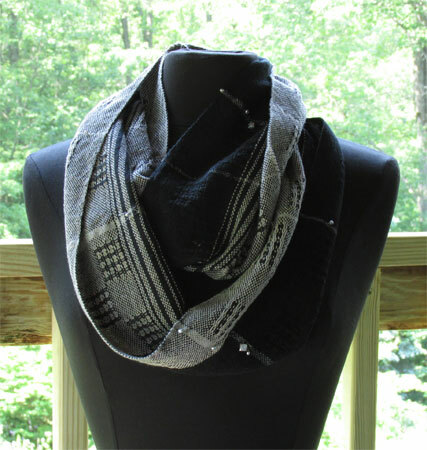 Stunning infinity scarves! I can see the black weft with blocks more clearly than the other. Love the dark stripe placement. Wonder if you use fibronaci to plan your stripes. Always so balanced and harmonious. Lovely! Thanks for sharing with us. Thanks, Ellie. I don’t use fibonnaci, but I made up a 64-thread gradient transition for all those baby wraps. I’m happy with it, so keep using it. I am a new weaver and would love to try your corkscrew and waves pattern but cannot read the draft. Somehow, I can’t get enough clarity to distinguish the threading and tie up. Will you share a clearer copy? Laurie – Do you have weaving software? Can you read a .wif file? If so I can send you one via email. Hi Peg,I would also love to have a copy of your corkscrew & waves pattern. I dont have weaving software. but would love it via e-mail if you have time. Thanks. Shirley. Without weaving software, the best I can do is send you a jpg like the one that’s in the post. I’ll increase the size a bit so hopefully you can see/read it easier. Will do, Hilary. Check your email. Hi. I love your beautiful design and would love to have the wif file. I just got a 40 in Macomber and would love to make this my first project. Thanks for sharing! Will do, Sharon. Check your email. I am loving this design. Would really appreciate a copy of the draft. Many thanks for sharing! Marian – Check your email! I do love your Corkscrew and Waves design. I would love to have the WIF file, and/or the weaving software for it. Thanks, Jean. I can’t send you the software – you have to purchase that, although you can get a free trial version of some. So you can’t use a wif if you don’t have the software ‘cuz you won’t be able to open it. I can send you a jpg of the draft, and will do that. Peg, I have just happened onto your site, and I love, love, love, that design! Could I bother you for a jpg of the draft, as I can’t quite make it out here? I have recently acquired a nice 16H AVL loom, and would love to try this draft. I am just venturing out from weaving simple rag rugs, and it has been so exciting. Look for the draft in your email, Pat. Enjoy your 16H – I have shaft envy, but know I don’t want to lift more shafts, nor do I want to go with a computer or lift assist, so I stick with my 8.